ORLANDO, Fla. - Florida wildlife officials are on pace this year to put down fewer than 20 black bears that pose a risk to public safety - the smallest number in five years - a sign that bear-resistant garbage cans and "bear-wise" rules may be reducing conflicts between people and the state's largest native land mammal. Last year, 57 bears deemed a safety risk by the Florida Fish & Wildlife Conservation Commission were euthanized, including eight in Lake, Orange and Seminole counties. So far, FWC has killed just seven this year, including a 550-pounder that tried to break into a Lake County home in April and a Longwood bear suspected of killing two dogs in May. In 2015, the year of Florida's first bear hunt in two decades, 106 conflict bears were put down by FWC. The hunt claimed 304 before it was abruptly halted after two days. "I think we are heading in the right direction," said Mike Orlando, assistant coordinator of FWC's bear management program, who is hopeful this year's good start will continue for the sake of both people and bears. "In some stage of becoming a 'bear-wise' community, there's 23 communities around the state now." Wingfield North, the gated Longwood community where the state's worst mauling occurred in December 2013, became the first in Florida to impose rules requiring residents to use bear-resistant trash cans to lock up their garbage and to eliminate other attractants that could lure a bear into the neighborhood from the woodlands next door. "Our bear-wise policy has been working very well," said Gary Kalieta, a lawyer and Wingfield North resident who helped draft the rules, adopted in June 2014. The community tracks bear sightings, which are reported to gate attendants and posted on the community's Facebook page. "There are a few anomalies, but we have been successful in limiting incursions, and when bears do enter the subdivision they usually just pass through to nearby subdivisions that are not bear-wise, since they don't find food in ours," he said. Bears had frequently invaded Wingfield's trash cans, garages and pools - at least two dozen times in 2014 alone. But that's happened just twice in the last 12 months, Kalieta said. 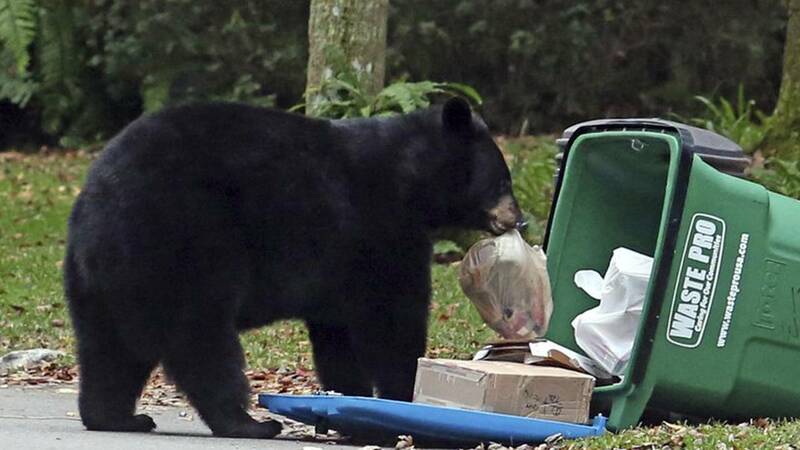 Sarah Barrett, who crunches bear data for the wildlife agency, cautioned against viewing this year's relatively low number of euthanized conflict bears year too optimistically - or giving too much credit to the increasing numbers of locktop trash receptacles used in Seminole County's Wekiva River Protection Area and other wildlife corridors where bears hang out. "It's unlikely it's just one or two things," she said. "There are many factors that can affect human-bear conflicts to varying degrees in any given year." For instance, Barrett pointed out, the region's longer, colder winter may have kept some bears in dens longer. Less-active bears generally means fewer residential sightings, fewer sightings mean fewer calls to the state's nuisance-bear hotline and fewer calls usually mean fewer kills. Also, the two months when bears are on their worst behavior are yet to come - October and November. FWC killed 20 bears in those months last year. FWC adopted clearer guidelines for handling conflict bears in November 2016, outlining when to put an animal down and under what circumstances it can be relocated. The agency put down 36 conflict bears and relocated 50 nuisance bears in 2016. FWC released or relocated 87 bears in 2017. While bear-wise rules could have some effect on this year's number of euthanized bears, Wingfield is the only community with 100 percent compliance in Central Florida. Barrett also cited "caller suppression" as a possible factor in Lake, Orange and Seminole counties. Some Central Florida residents may be heeding the advice of bear advocates such as Katrina Shadix, a Seminole woman who is director of the nonprofit advocacy group Bear Warriors United, which has discouraged people from calling FWC for fear the agency will kill a problem bear. Shadix disagreed with FWC's decision to put down the bear that killed the dogs in Longwood. She faulted residents who didn't secure their garbage in neighborhoods along Markham Woods Road for unwittingly luring the mama bear and her cubs in. "She wouldn't have been in that neighborhood in the first place if people had done the right thing to start with," said Shadix, who offered to retrofit garbage cans with locking devices. FWC identified the 236-pound bear as the animal identified in attacks on a poodle named Maggie and a Maltese-Yorkshire terrier mix in The Estates at Springs Landing. "Public safety is a top priority of the FWC, so this bear was humanely killed due to its escalating conflict behavior that posed a risk to the public," FWC spokesman Greg Workman said. Brenda York, 54, called FWC in April after a big bear punched holes in the front door and cracked the door frame of her home in the Pine Lakes area of northeastern Lake County. FWC set a trap baited with doughnuts, caught and euthanized the 550-pound animal. "My grandbabies was fixin' to come down for a visit," York said. "I felt bad. I even cried for the bear but I didn't want my grandbabies hurt, neither."